From macro and micro perspectives, this book provides a panoramic view of China's sprawling western region. 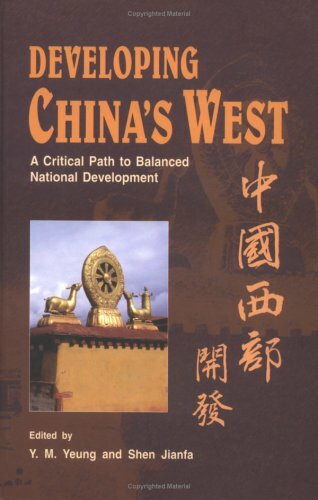 China's twelve western provinces are examined through several critical thematic dimensions. Yeung Yue-man is professor of geography and director of the Hong Kong Institute of Asia-Pacific Studies, at the Chinese University of Hong Kong. His research interests are China's coastal cities, South China, globalization and Asian cities. He has published extensively, including Emerging World Cities in Pacific Asia (1996), Shanghai (1996),Globalization and the World of Large Cities (1998), Guangdong (1998) andFujian (2000). Shen Jianfa received his Ph.D. degree from the London School of Economics. He is an associate professor in the department of geography and resource management at the Chinese University of Hong Kong. His research interests are spatial population modeling, migration analysis, and urban and regional development.